TWO MASTER BEDROOMS AND 2 MASTER BATHROOMS! THIS IS A GREAT OPPORTUNITY FOR A COLLEGE STUDENT, MEDICAL PROFESSIONAL OR AN INVESTOR WANTING TO ADD TO THEIR RENTAL PORTFOLIO. CONVENIENT LOCATION NEAR INTERSTATES, SHOPPING, DINING AND ACROSS THE STREET FROM VIRGINIA BEACH TCC CAMPUS. THE UNIT NEEDS A LITTLE TLC TO MAKE IT YOUR OWN BUT IF YOU WANT TO BUILD SOME SWEAT EQUITY, THIS PROPERTY IS FOR YOU! Ready to visit 3506 Argo? Request a free property tour! 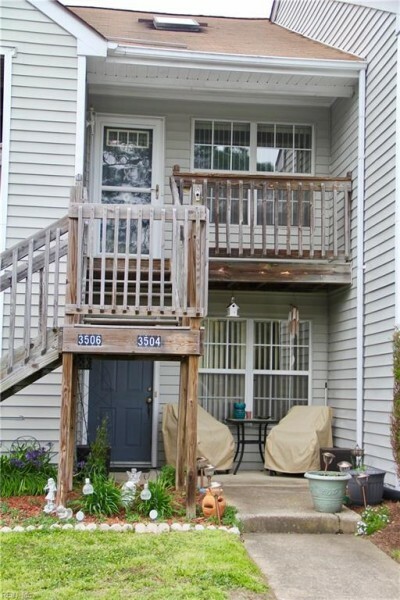 Send me more information about the listing at 3506 Argo, Virginia Beach, VA 23453, MLS# 10252883. This 2 bedroom, 2 bathroom home located at 3506 Argo, Virginia Beach, VA 23453 has approximately 904 square feet. It is currently listed for $95,000 and has a price per sqft of $10,509. This home is currently New Listing under the MLS#: 10252883. This listing is provided by Keller Williams Town Center. 3506 Argo Court, Virginia Beach was built in 1986. It has Assigned/Reserved parking.The kitchen includes Dryer, Elec Range, Refrigerator, Washer. 3506 Argo is part of the Green Run neighborhood located in 23453.